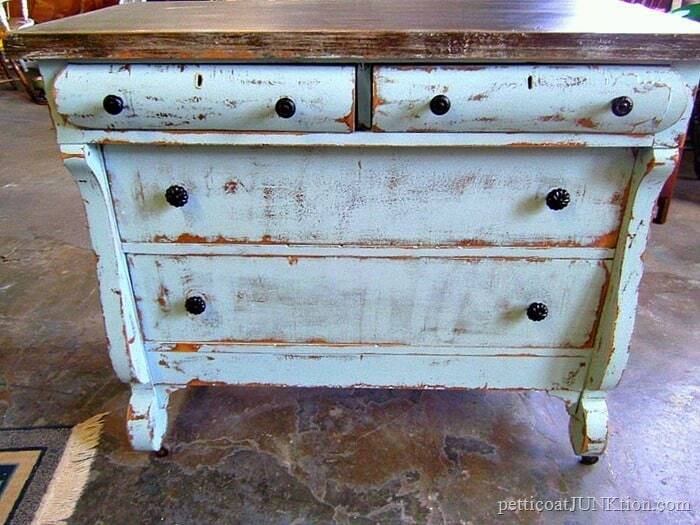 Painted furniture is so pretty and painted furniture with multiple colors is even better. The projects today are from my early days of painting furniture and you haven’t seen them before. At least I don’t think you have. I wrote about these makeovers when I completed the projects but the posts are now buried under several years of furniture makeovers. None of these projects are similar to anything I’ve done in the past few years. 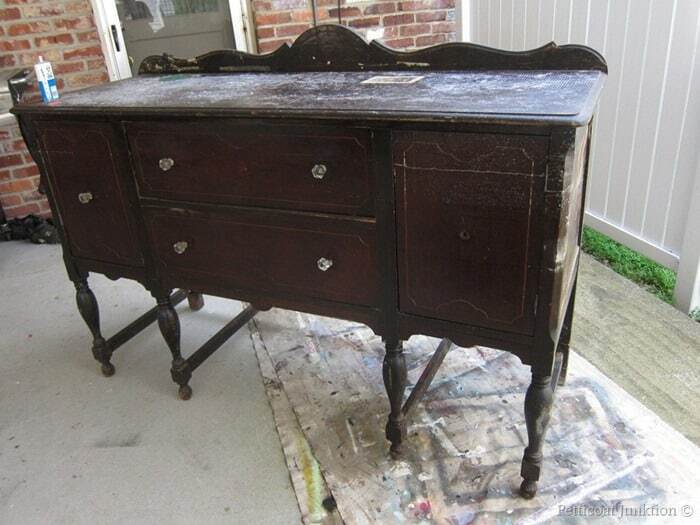 The first project is a two-tone dresser. 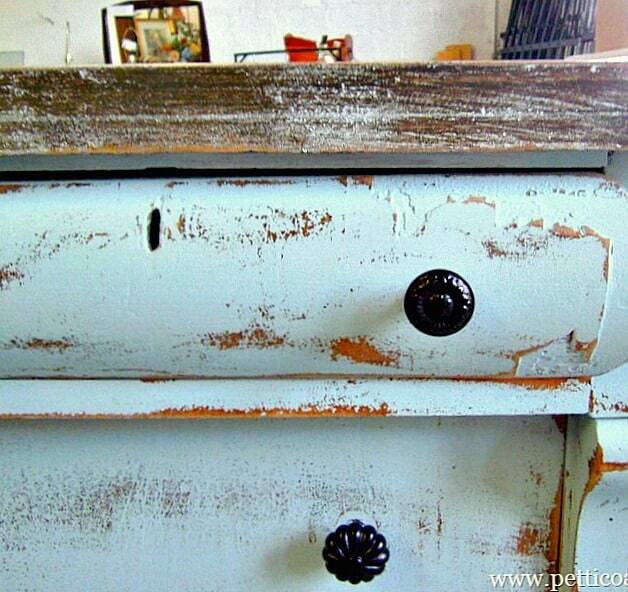 I painted the top with Caromal Colours Textured Basecoat paint in Mocha. The body color is a soft turquoise. I mixed the color from paints I had on hand. You guys know I love making my own custom colors. 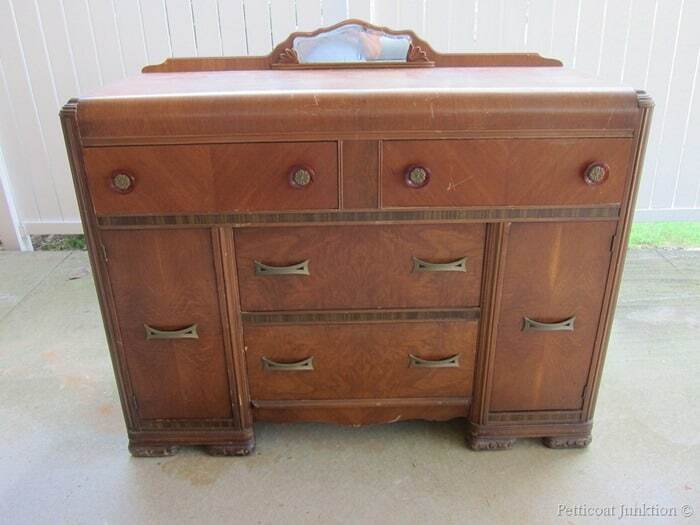 The dresser is an antique and I think the style is called Empire but don’t quote me on that. Some of the knobs were missing and the ones that were there were UGLY. They were newish and in shades of green and yellow. The new brown knobs are from Hobby Lobby. 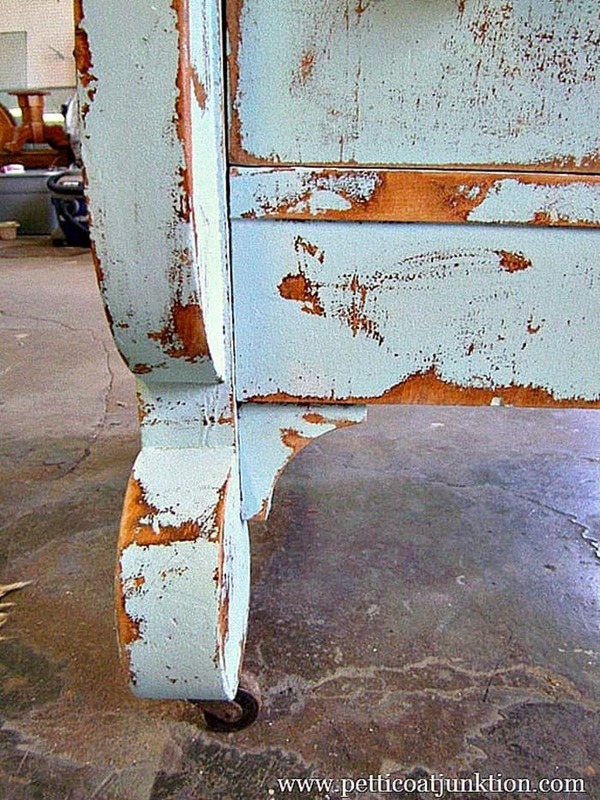 As you can see I did a heavy distressing job…..all over. Makes me smile. Love those legs. And furniture on rollers is a dream come true. The photos here are not the greatest. When I first started blogging I used my point and shoot camera on the auto setting and usually in bad lighting. I also didn’t save the original image files. I tried to edit the photos from the old posts but they didn’t turn out much better. I would say picture the furniture ten times prettier than in these photos (Kathy smiley face). 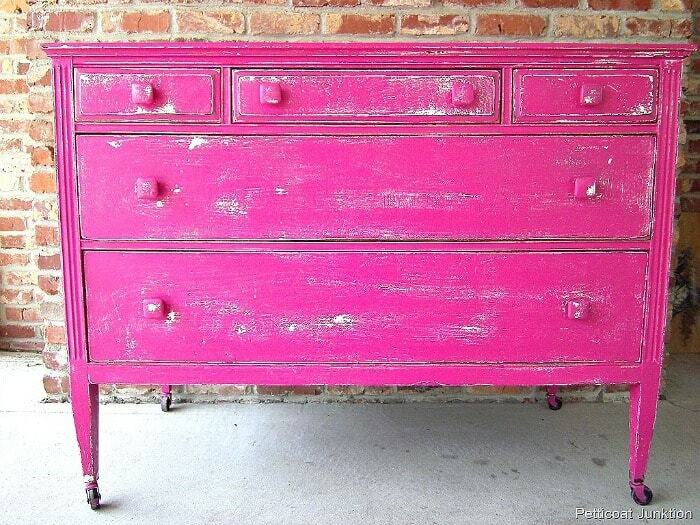 The Hot Pink dresser was one of my favorite pieces. Not just because of the color. I like the straight lines of the piece. Notice it’s on wheels too. 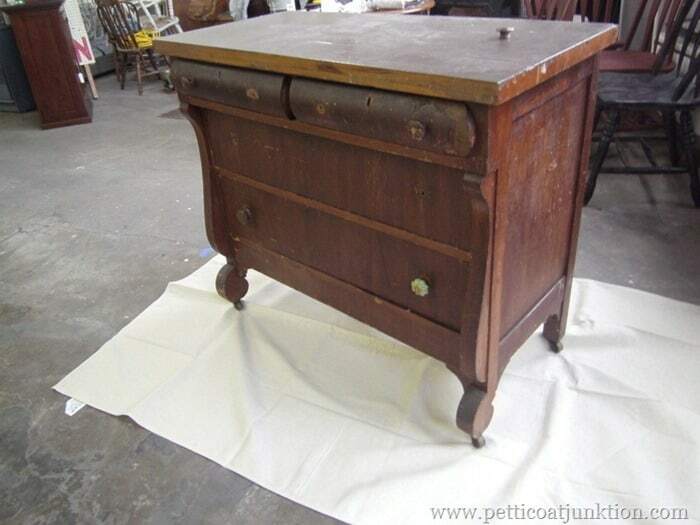 A lot of the vintage and antique furniture had wheels or casters. 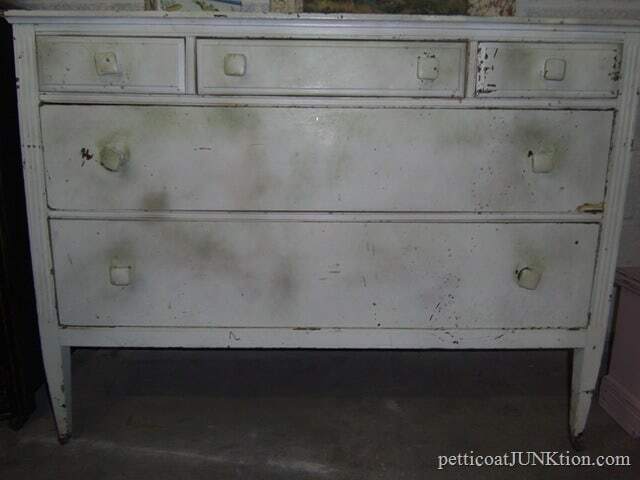 Someone had spray painted the dresser. Not very pretty. I liked the square wood knobs and decided to stick with those. This was a custom order for a children’s clothing shop and the owner selected this beautiful paint color. I’m sorry but I didn’t note the name. I wish I had because I would love to use the color again. The paint and can is long gone. 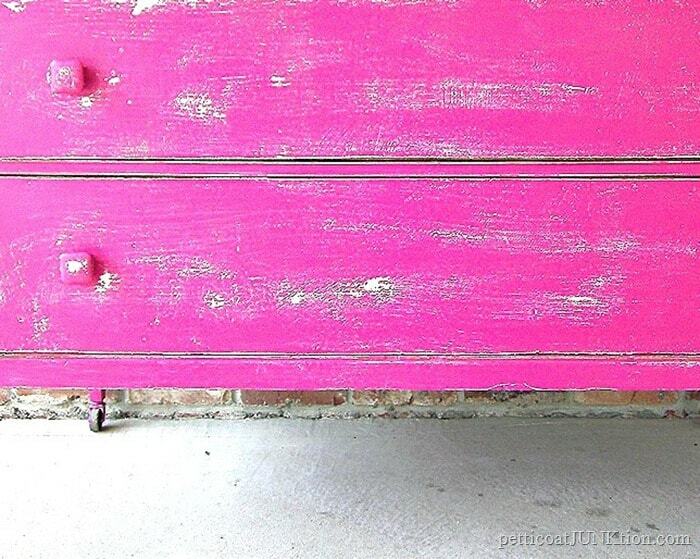 Again, I distressed the dresser and the original whitish color can be seen peeking through the Hot Pink. 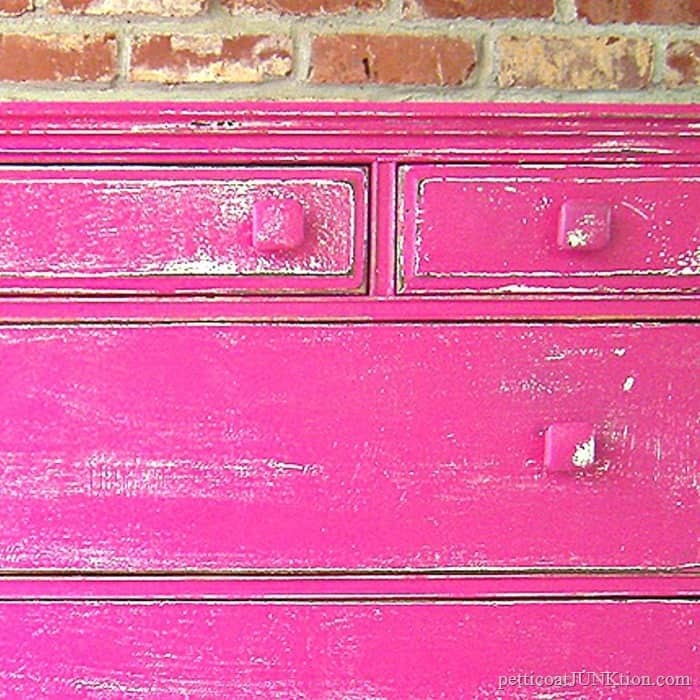 I painted the knobs the same pink color. 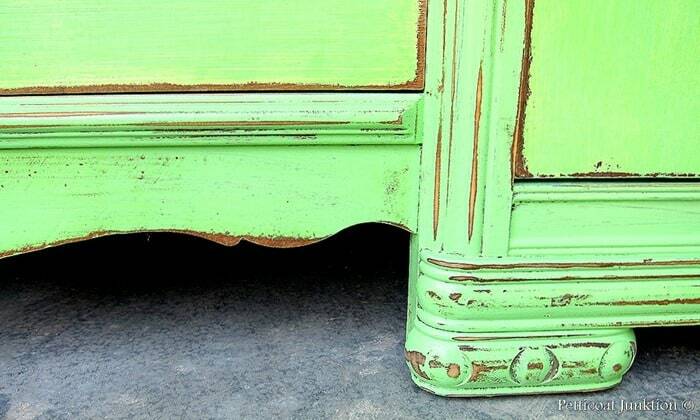 Vintage sideboards…or buffets….are usually beautifully detailed. This one was no exception. The layered paint technique was something I experimented with on the sideboard. 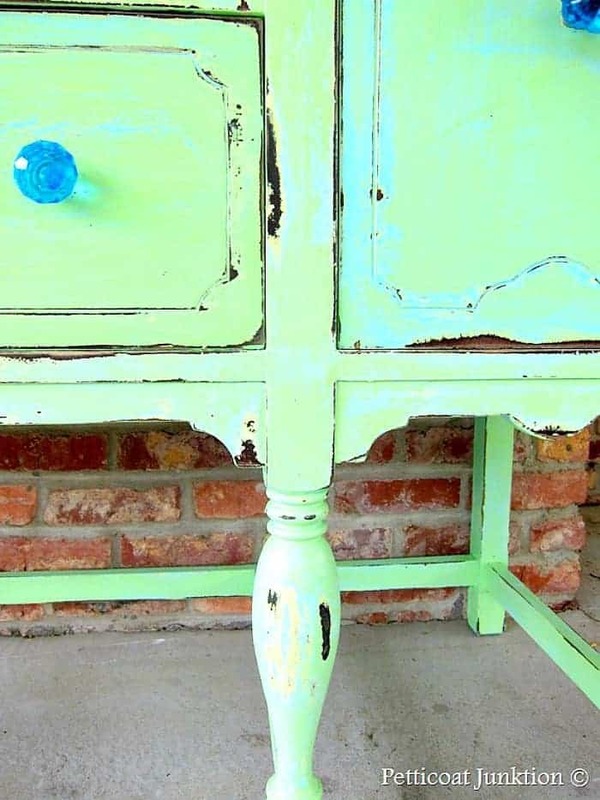 I used 7 layers of paint including white, green, yellow, and turquoise, in various layers. 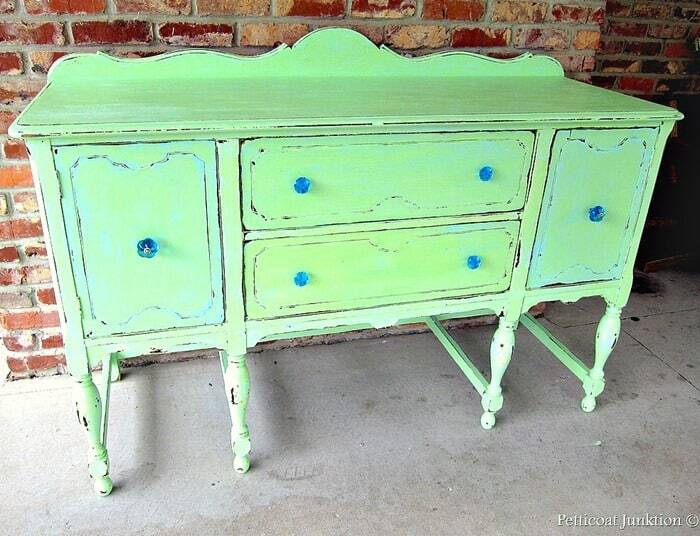 The glass turquoise knobs came from Hobby Lobby and the sideboard sold the same day I took it to the shop. The next buffet is totally different. It’s a waterfall style. The original mirror was a plus. A lot of times they were cracked or missing. 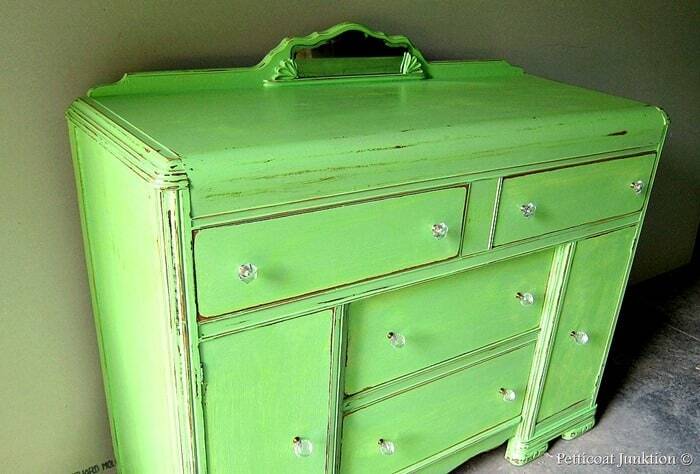 The color is lime green and I distressed the paint so the original wood finish would show through. I filled the screw holes where the drawer pulls were and added clear glass knobs. The details on the feet distressed nicely. The last piece was painted in 2009 before I started blogging. I don’t have a before photo and this is the only photo I have of the finished look. I used Caromal Colours Textured Basecoat on the wardrobe. The bottom layer is Paprika color and the top layer is Mustard. In between the layers is a product called Chipping Crème by Caromal Colours. I haven’t used this product in years and I’m thinking I may want to work with it again. I have another project from years past that you will just love. I call it my nemesis and you can see it here…Neutral China Cabinet. Kathy do you have a preference on paint brands? I see you use Behr but that means you have to really prep the piece first right. And what brands of glaze and topcoat do you use? Thanks. I am interested in purchasing the caromal colours that you used on the last pic of the mustard wardrobe with the glass door. I am having difficulty finding them online. Also interested in Beyond paint. 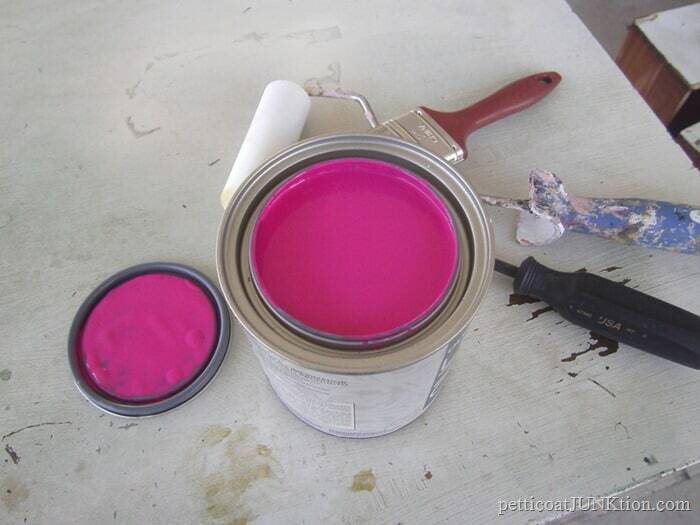 Do you know of a website I can pull up that will offer these different paints? Love all the pics!!!! HI Lisa, You can find the Caromal Colours paint at caromalcolours(dot)com and shop for the textured basecoat. You can visit my Amazon page to find the Beyond Paint. The link is in the blog post. I can’t put it in my comment here. Sorry. Thanks for your comment! What kind of sand paper can I use to distress?? I especially like the 7 layers of paint in white, green, yellow and turquoise, my favorite piece you showed today. 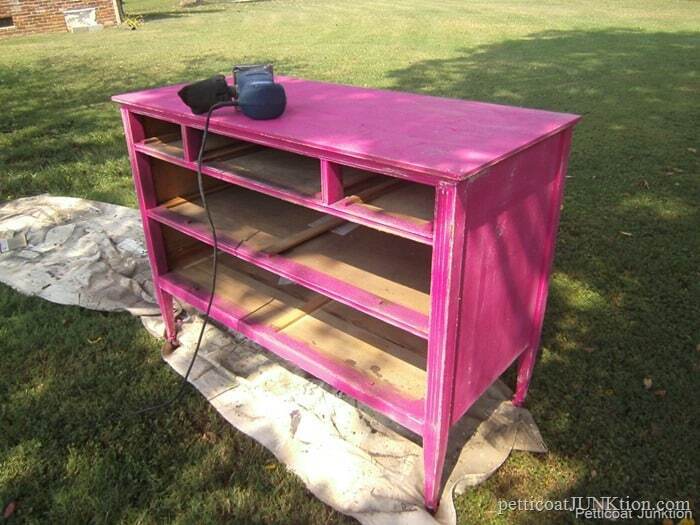 Yes, I would love to see you do more furniture using multiple layers of paint. The turquoise glass knobs from Hobby Lobby really POP on the 7 layered side board. I DO like the multiple colors! Gives the impression the piece was painted over and over through the years. i wouldn’t say your painting has “changed,” but “evolved.” I think in anything, our craft changes as we mature with ideas and experience. I love those colors you used way back when. 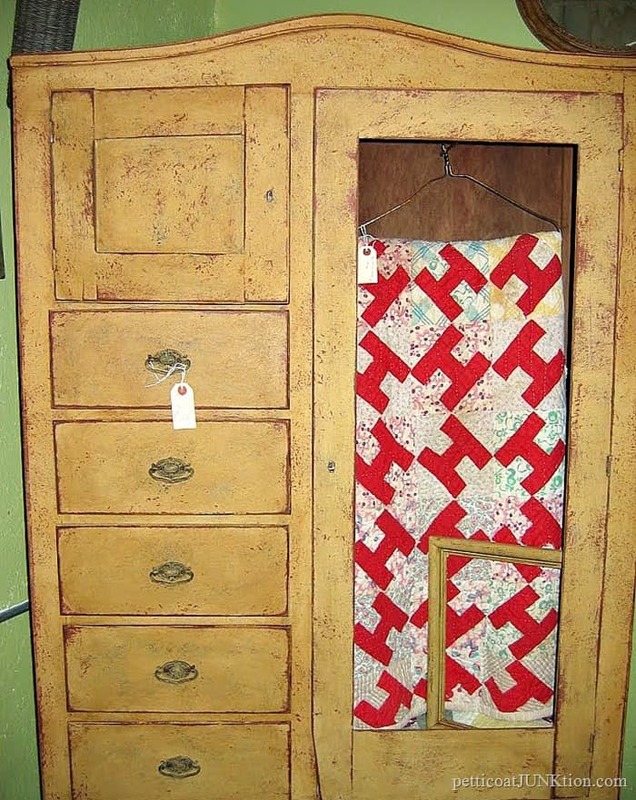 Of course, I’ll always have a soft spot in my heart for the red quilt keeper. I can’t remember the name of the piece. Hey Fonda! Thanks for the comment. I haven’t heard from you in a while and was getting worried. You’re talking about my Tricycle Red Radio Cabinet. It’s everyone’s favorite and I’m looking at it now as I sit in my living room. Love all of these furniture pieces. They look incredible!